Global shipbuilder Austal Limited has successfully secured a contract for a naval customer in the Middle East for the design, construction and integrated logistics support of two 72 metre High Speed Support Vessels (HSSVs). 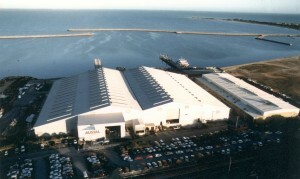 AUSTAL YARD, MAIN FACILITY, HENDERSON, AUSTRALIA. According to the media release, the value of the contract is approximately US$124.9 million (AUD137 million). Austal will build the HSSVs at its shipyard in Henderson, Western Australia. The construction of the first vessel is expected to commence in the 2014 calendar year, while the second vessel is expected to be delivered in the 2016 calendar year. Austal Chief Executive Officer Andrew Bellamy said the deal reflects their strategy of pursuing higher-value, defence vessel export opportunities in new markets. “I am delighted that we have been awarded this contract, which is in line with our strategy of leveraging our revolutionary intellectual property and technology to new defence markets, particularly for underpinning the Henderson shipyard,” Mr Bellamy said. Austal said the vessels will offer a range of capabilities that will provide support to naval operations. These include helicopter operations, rapid deployment of military personnel and cargo, and search and rescue operations. The HSSVs will be deployed with a similar mission to the Joint High Speed Vessels currently being constructed by Austal for the US Navy at the Company’s shipyard in Mobile, Alabama.